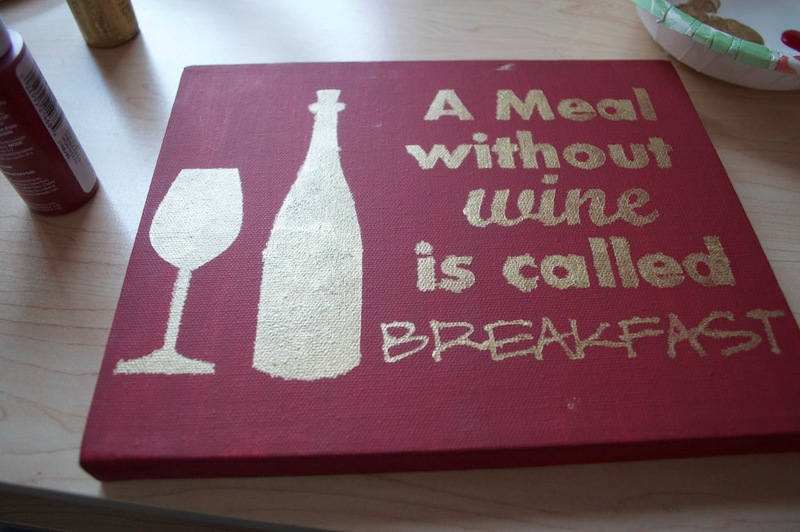 While wondering around the home decor aisles of Ross one day, I found an eclectic sign with the saying "A Meal Without Wine is Called BREAKFAST"
As a wine lover, I loved the sign and thought it was hilarious. However the one in Ross was very tacky looking and not something I wanted to decorate my kitchen with - so I made my own! 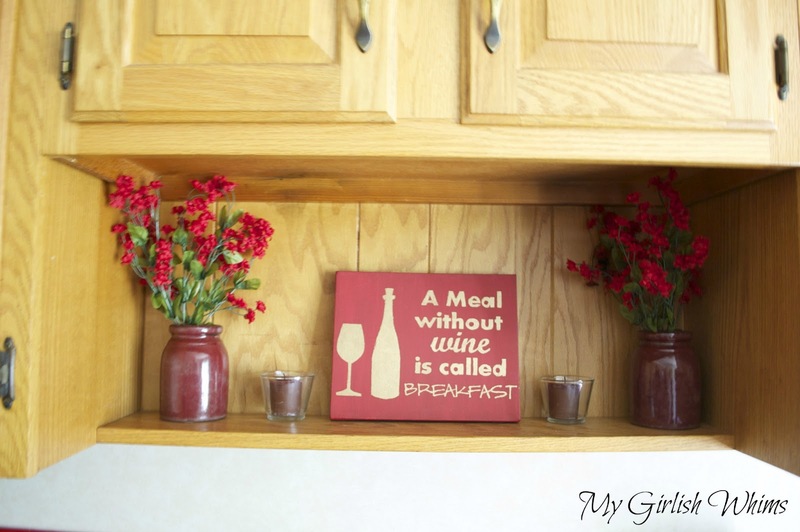 I love how it turned out: classy but funny and with custom colors to match my kitchen! PS- I loved this sign so much I'm now selling it in my etsy shop! 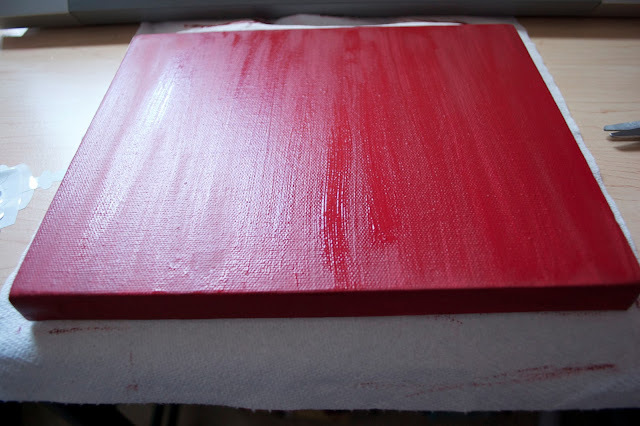 I started with an 8x10 canvas I got at Michaels. While I was waiting for the canvas to dry, I designed the art for the canvas and cut the design out with my silhouette on vinyl. I weeded out the letters and just kept the background to be able to stencil with. 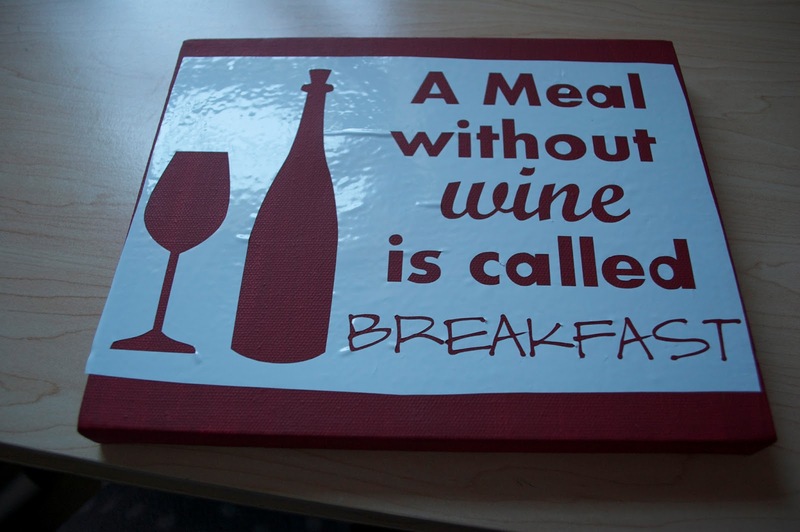 After a few sticky failed attempts and grumbling at the thin font of "breakfast" that kept giving me trouble, I finally got the vinyl onto the canvas. Don't forget to bring over the inside parts of the e's and a's etc. 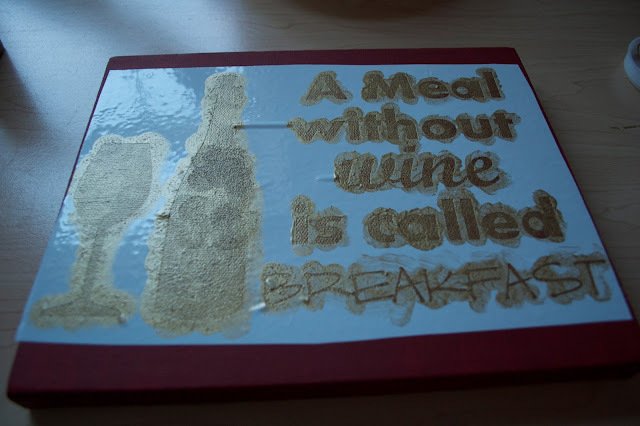 Next I stenciled on the words and art using a gold craft paint. After I was done stenciling I pulled off the vinyl and....ick! Haha. 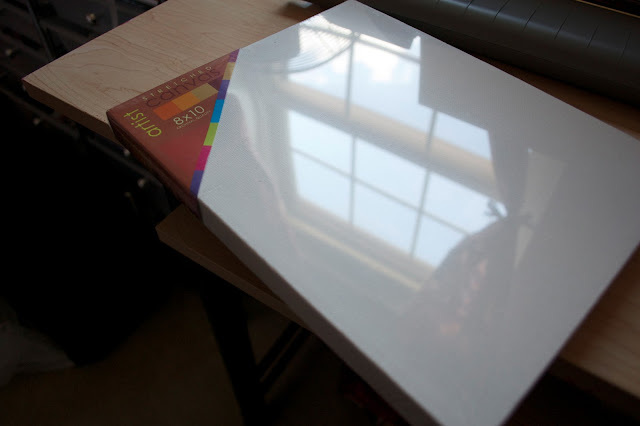 There was a little bleeding under the vinyl. But not to fear! 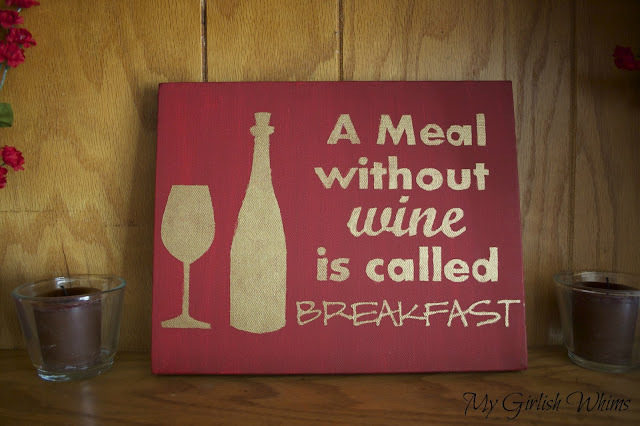 I displayed the sign in the kitchen after I made it, and when hubby came home he said "I see you bought a new sign!" and then I was really impressed with myself. I tried to make him guess where I bought it until he gave up and then I told him I got it from my craft room!! 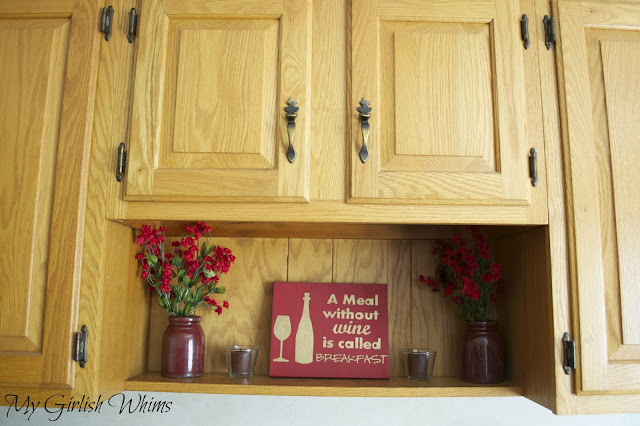 I put the sign in my kitchen in this little display shelf above the sink. For the whole first year we've lived here I did NOT know how to decorate this little space. I'm so pleased with how it looks now! I got the little red vases for $6 total at a local boutique and she threw in the candles for free. The candle holders were recycled from a wedding favor and the flowers were less than 8 bucks from Michaels. Now this little nook is so cheery! 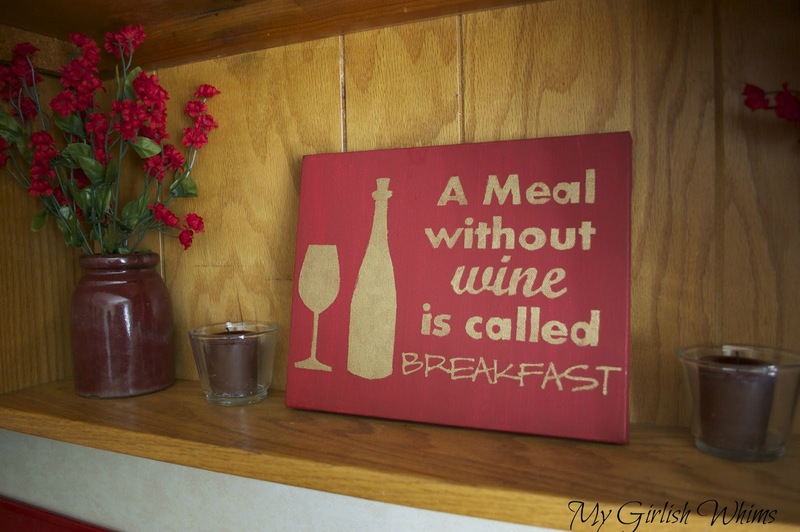 I think every kitchen needs a little quirky saying sign - and this one is perfect for me! hehehehehe, LOVE!!! 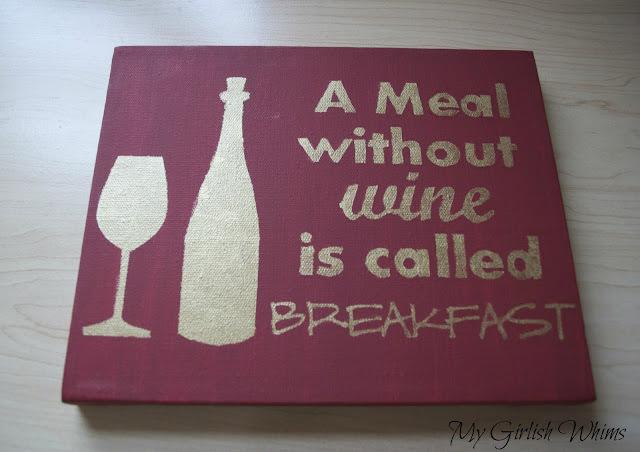 btw champagne breakfasts rock! ha ha! super cute : ) My husband would love that. That is great--you did an awesome job..and the sentiment does make me LOL! Cute! I'm dying to make some cute signs but I don't have a machine to cut a stencil - any tips for those of us without the right tools? Thanks! 2momma2, you could always try freezer paper stenciling with an exacto knife! 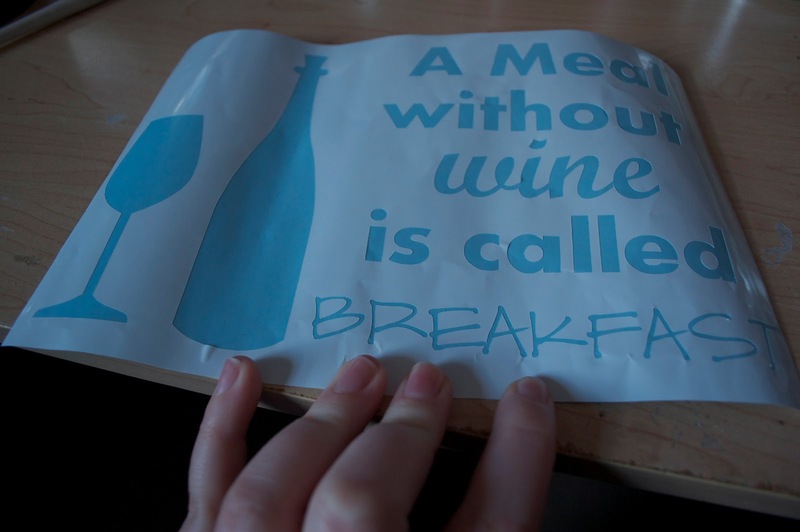 My best friend is getting married this fall, and she is a fellow wine lover. 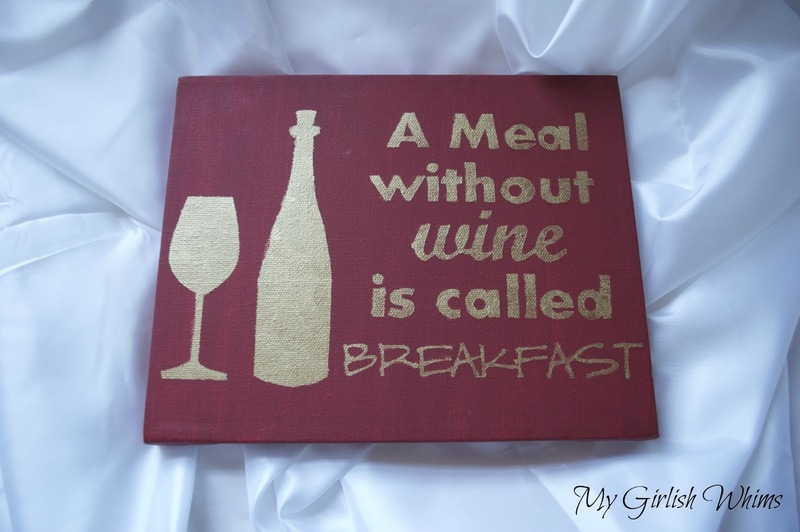 I have plans for wine cork décor, and this will go perfectly! Thank you so much for sharing.